In the last couple of weeks I have read and heard several comments that seem to imply that those who eat gluten-free diets, or most special diets, do it to be trendy, difficult or that only the wealthy can afford to have a special diet. Some of these comments are hilarious, and honestly, there is truth behind them. The strain that eating a special diet can put on your wallet is serious. But, it doesn’t have to be that way. I eat gluten-free because if I didn’t I would not only be sick all the time, but also a terrible and inactive person. I am also able to do it without spending a lot of extra cash, and without crying over the bakery counter at the coffee shop. This list I have compiled after four years of eating gluten-free can help you do it and be happy about it. 1- Realize how certain foods may be hurting you: Before I knew I had an intolerance to gluten, I spent two years of my life with fatigue, stomach pain, bloating and a delightful bad mood. Not good for anyone around me. 2- Learn about your body: Once I eliminated gluten from my diet I looked for signs that showed me that my body was changing for the better. The most obvious were that I was happy, energetic and thinner. But after months of eating gluten-free I noticed that my hair was fuller, and my skin more supple. 3- Accept that changing your lifestyle is a process, don’t be hard on yourself: The first year was one of going back and forth between eating gluten-free and not. The second one of learning to cook and enjoy gluten-free food, and the third one of eliminating gluten from my cosmetics. It is easy for me to eat gluten-free, but it took some time get here, and that is fine. 4- Eat regular food: While there are many gluten-free options in the supermarket, these are generally grossly overpriced and not that healthy. Trying to eat gluten-free off the packaged meals in the supermarket shelves would definitely be cost prohibitive and would defeat the purpose of wanting to eat healthier. So I try to skip most of these options and buy foods that are naturally gluten free: gluten-free grains (rice, millet, corn, buckwheat etc), legumes, vegetables, fish, meat and some dairy. 5- Learn to bake: While eating a scone with my Saturday morning coffee at the local café is a thing of the past, baking with gluten-free flours is not that different from baking with wheat flour. I have become a better baker in these last four years. Some of my most memorable achievements: Hummingbird Cake and Chocolate Chip-Banana Bread. 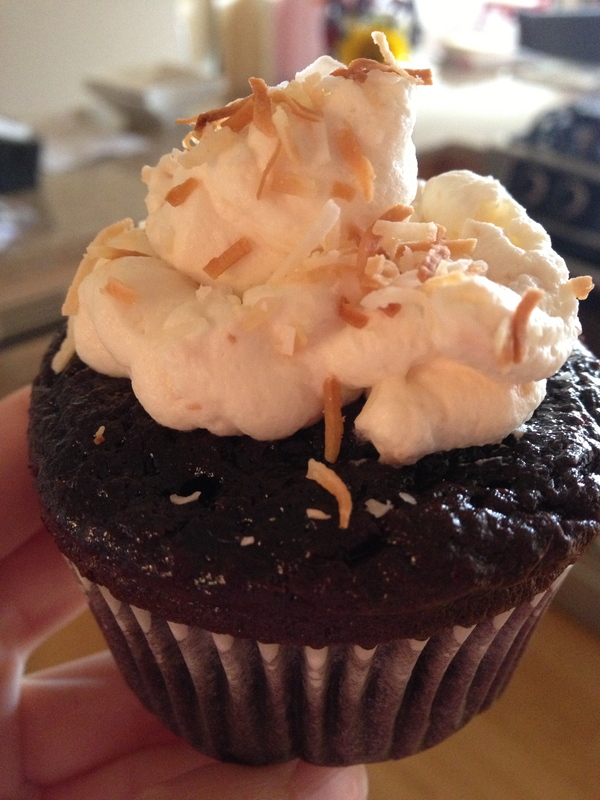 This chocolate cupcake with coconut whipped cream is gluten free. Not healthy, but it was delicious! 6- Realize what you are not missing out on: Every time I have gone back to eating gluten, either on purpose or by mistake, I have suffered three days of bloating, stomach ache, headaches and fatigue. Three days, enough said! 7- Learn about ingredients: When I go out to a restaurant I ask the server for their gluten-free options and the ingredients in their meals, then choose accordingly. Tricky ingredients include most sauces and salad dressings. But what is better than olive oil, salt, pepper and balsamic vinegar? 8- Be appreciative: When friends, family and colleagues go the extra mile to accommodate my needs (and they do) I make sure they know how much I appreciate their effort. 9- Be O.K. with others’ food: Friends often ask if they should eat bread in front of me. ABSOLUTELY! I have no regrets about eating gluten-free and I don’t think I should impose any restrictions on those around me. This also helps people realize they shouldn’t impose their diet on you either. 10- Enjoy: Gluten-free food can be real, good, delicious food. Eat up and enjoy. Thanks for reading! I am not sure I understand your questions, but yes! You can eat gluten-free without a problem. Most fresh foods are naturally gluten-free, you just need to buy real whole foods and cook them yourself. And many more restaurants are now offering g-free menus. The options are really out there, you just need to learn a bit more about what you are eating. Are you trying to make healthful dietary changes> Read on! Change can be hard, but the feeling of good health, strength, vitality and increased energy can be pretty motivating! Excellent article — your points are well taken. I have found that once a person learns to listen to his/her own body, changes come easier and easier. Really, who wants to feel sick all the time? Once you start feeling your best, you won’t want to go back to eating the things that made you sick! Change is a process and all too often we try to rush it. Be understanding and forgiving with yourself. After all, it took years to get to the point of feeling bad, it may take some time to undo the damage! Reblogging! Great blog! I think many of us get pigeon holed for our dietary choices! I eat a paleo diet because I have never felt better, and my daughter doesn’t eat peanuts because yes actually they can kill her! I think people who are not intuitive to their bodies and their own health are the first to judge others.